The Planet Fútbol crew breaks down the stunning events in the CONCACAF Gold Cup semifinals, detailing everything from Jamaica's shocking win over the USA to the ugly, chaotic and controversial scenes in Mexico's triumph over Panama in our latest podcast. After of the more eye-opening nights in CONCACAF history, it's time to process everything that went down in the Georgia Dome during Wednesday night's Gold Cup semifinals. In one of the greatest upsets in the history of U.S. men's soccer (the biggest?) the Americans fell to Jamaica 2-1, opening up a whole new slew of questions for Jurgen Klinsmann and preventing the USA from automatically clinching a place in the 2017 FIFA Confederations Cup. Ultimately, how important is the Confederations Cup, though? And where does this leave the USA going forward in anticipation of the October 9 playoff against the 2015 Gold Cup winner? That winner will be either Mexico or Jamaica, after Mexico prevailed over Panama in Wednesday's nightcap, but the scoreline was secondary to the antics on the field. SI's Grant Wahl and Brian Straus share their first-hand experiences from Atlanta, where CONCACAF shenanigans, controversial refereeing decisions, brazen Panamanian players and downtrodden U.S. ones were the stories of the night as we all get set for an unlikely Mexico-Jamaica final. 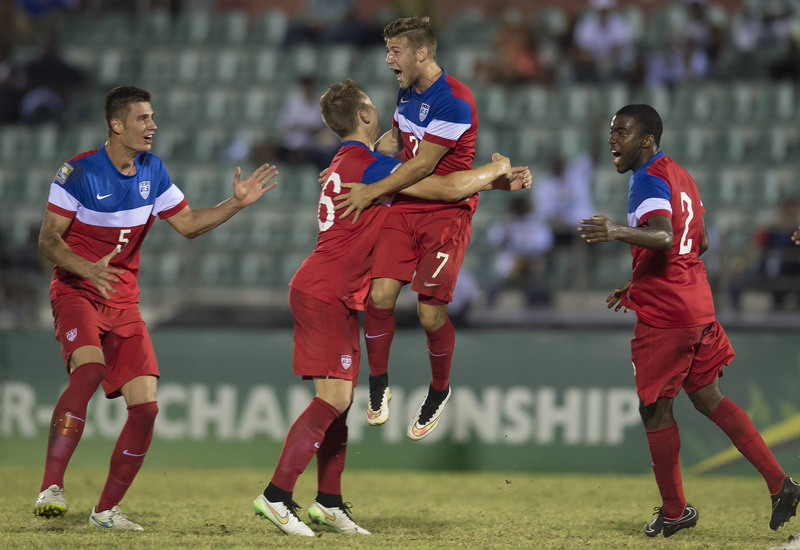 Paul Arriola (7) celebrates his goal in a World Cup qualifying playoff match vs. El Salvador. 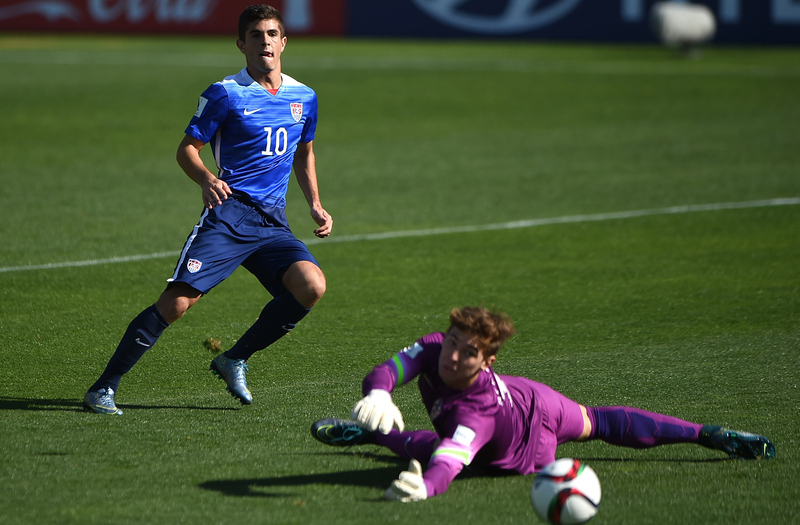 The U.S. U-20s cemented their place in the World Cup with a 2-0 win. They drew host New Zealand, Ukraine and Myanmar in their summer group. 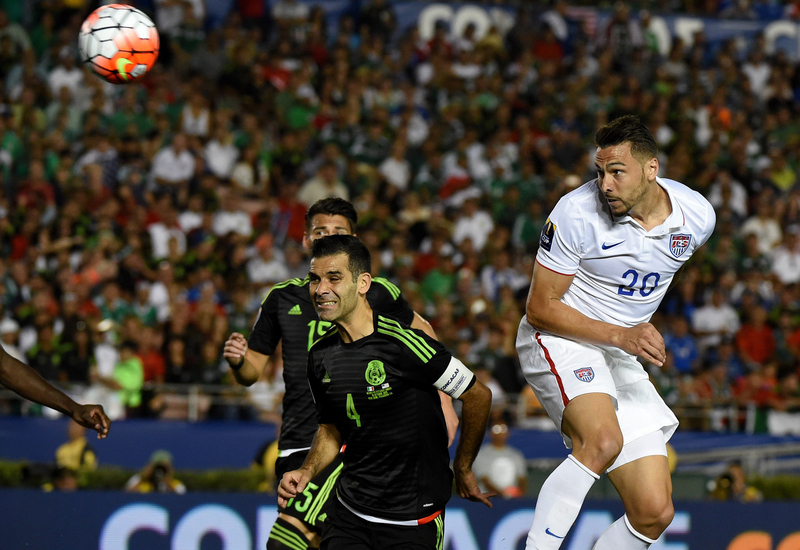 Bobby Wood flies high in the USA's 3-2 loss to Chile, which opened the calendar year for the national team. Brek Shea and Jozy Altidore scored in the loss. 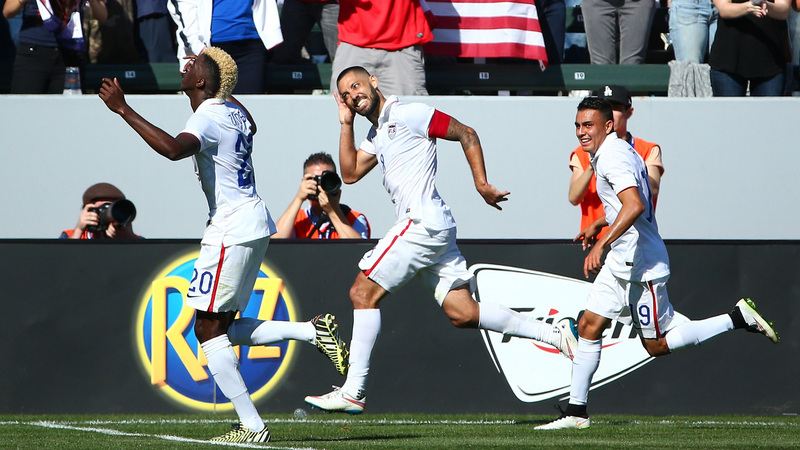 Gyasi Zardes and Clint Dempsey celebrate after combining for a goal against Panama at StubHub Center to cap off winter training camp with a 2-0 victory. 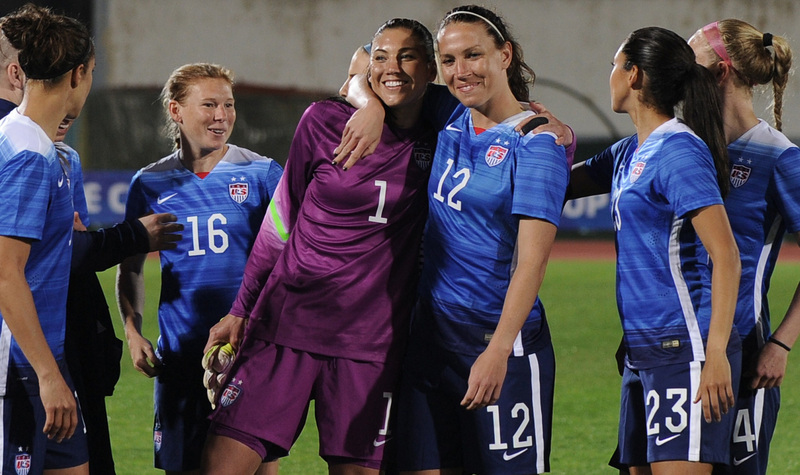 Lori Chalupny (left) and the USWNT had a tough time keeping pace with Jessica Houara (center) and France in a 2-0 loss in a friendly in Lorient. 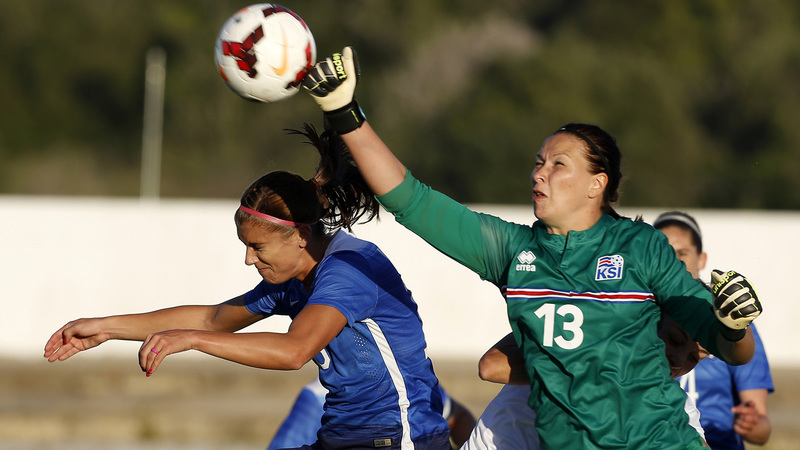 The match was the first of two played without suspended goalkeeper Hope Solo. 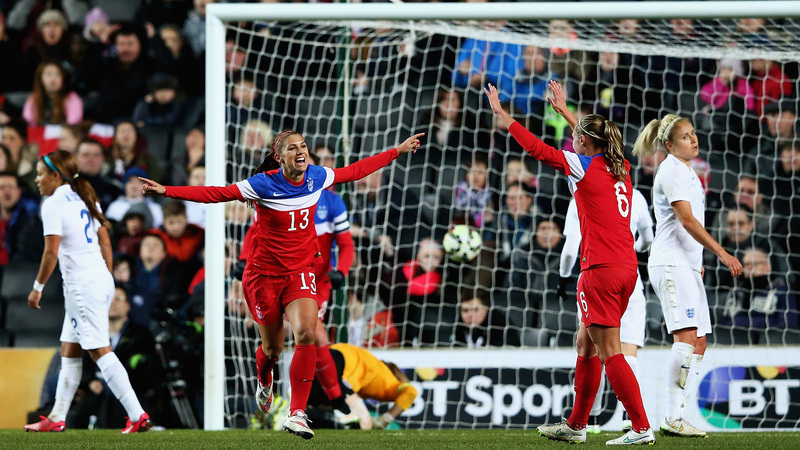 Alex Morgan celebrates scoring the lone goal in the USWNT's 1-0 win over England in a friendly at Stadium mk in Milton Keynes. The USWNT opens the Algarve Cup with a 2-1 win over Norway, marking Hope Solo's return from a 30-day suspension with a come-from-behind victory. Carli Lloyd scored both goals for the Americans. 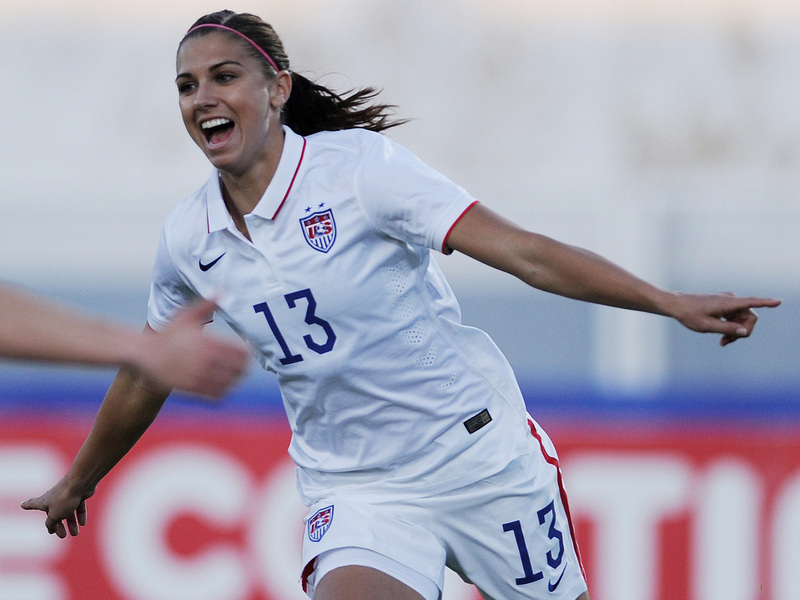 Alex Morgan celebrates her goal in the USWNT's 3-0 win over Switzerland in the Algarve Cup group stage. Alex Morgan and the USWNT were frustrated by Iceland, held to a 0-0 draw to wrap up group play at the Algarve Cup. 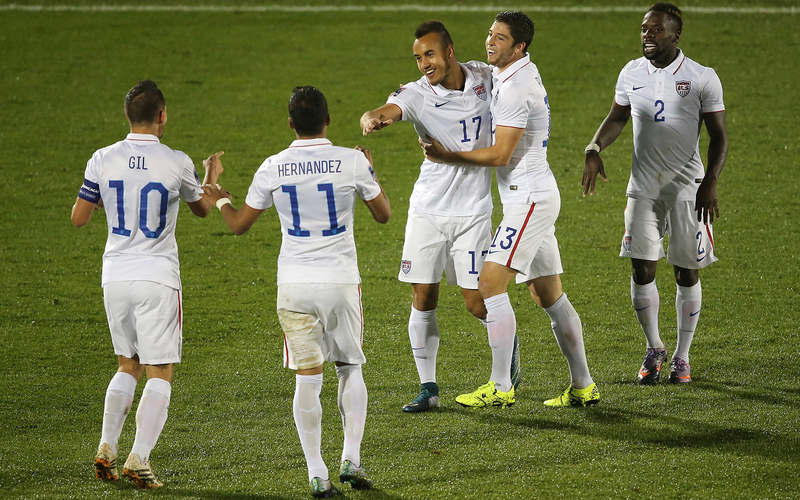 The result was still enough to put the Americans in the final against France. 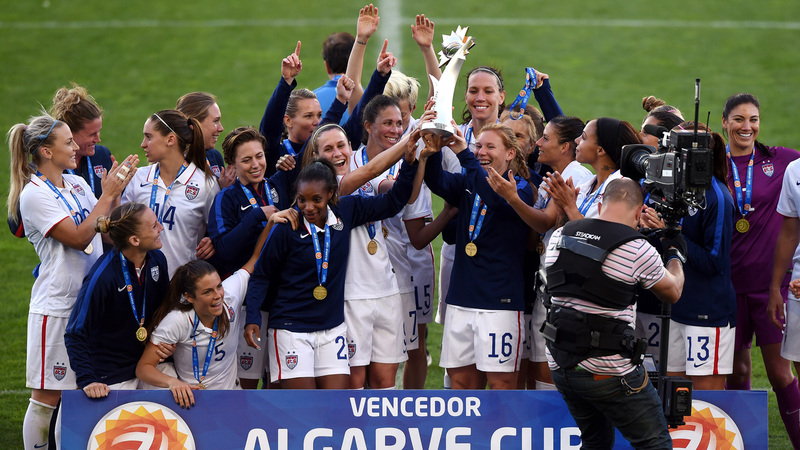 The U.S. women's national team celebrates winning the Algarve Cup after a 2-0 triumph over France. 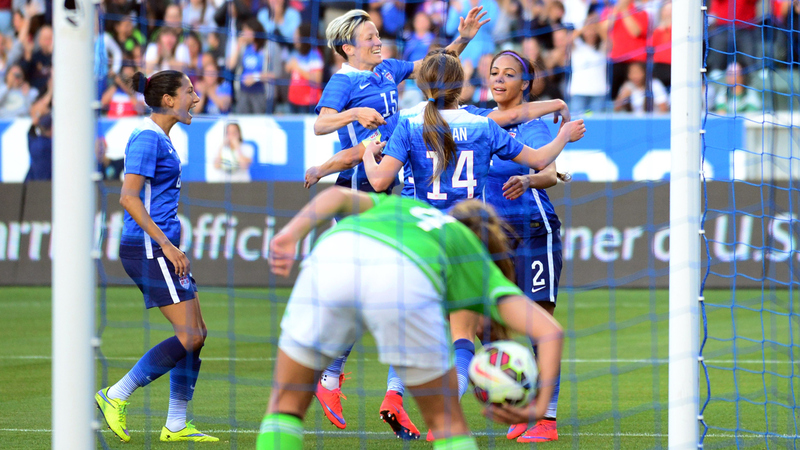 Julie Johnston and Christen Press scored, and Hope Solo saved a penalty kick. 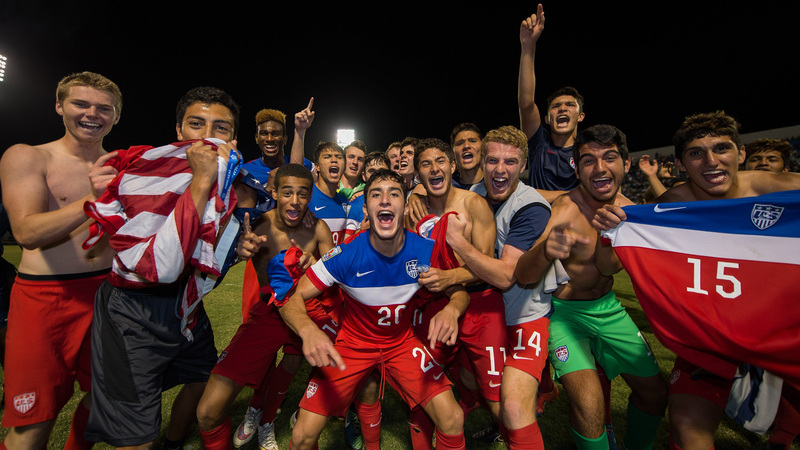 The U.S. U-17 national team celebrates qualifying for the FIFA U-17 World Cup after defeating Jamaica on penalty kicks following a 0-0 draw in a playoff match. 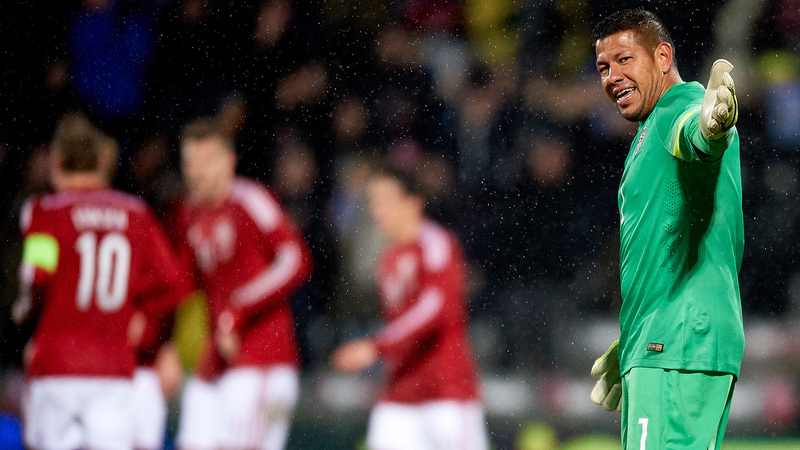 U.S. goalkeeper Nick Rimando expresses his frustration after one of Nicklas Bendtner's three goals in Denmark's 3-2 win over the Americans. 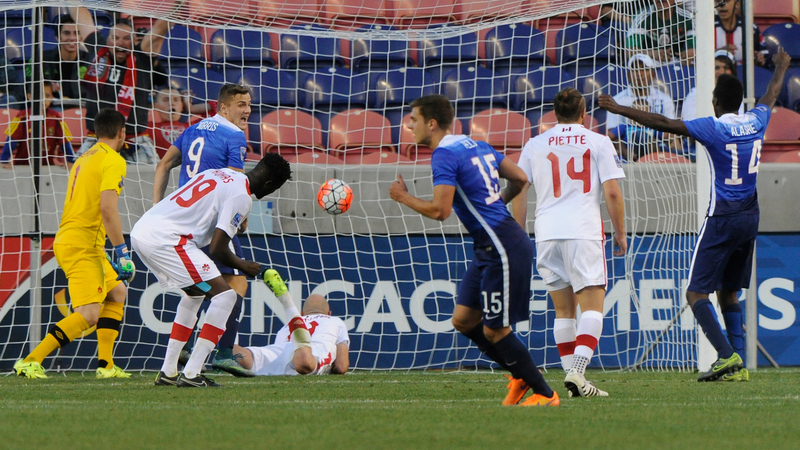 Jozy Altidore and Aron Johannsson scored for the USA. 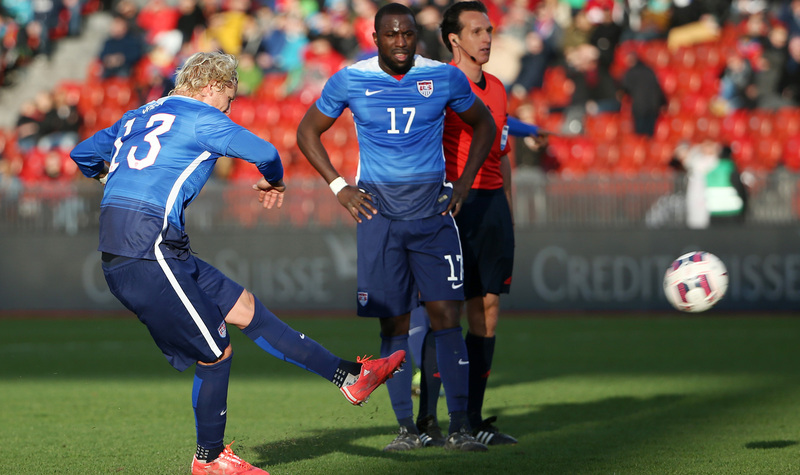 Jozy Altidore watches as Brek Shea hits a perfect free kick to put the USA on the board against Switzerland. The Americans settled for a 1-1 draw. 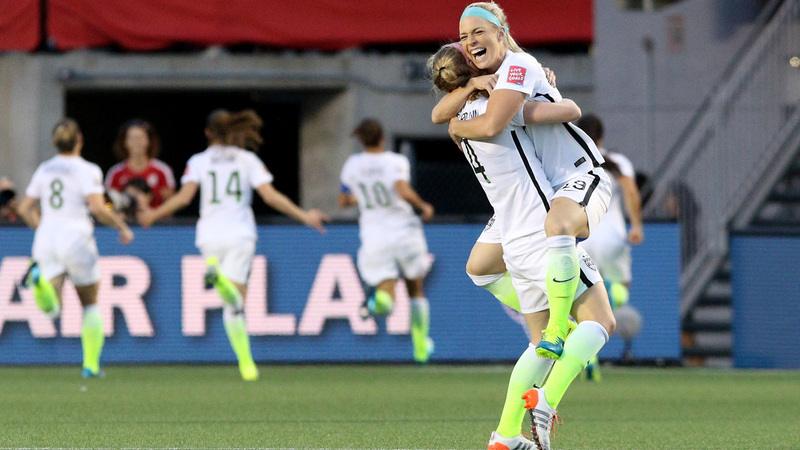 Lori Chalupny (16) celebrates her goal vs. New Zealand with Lauren Holiday at St. Louis's Busch Stadium. 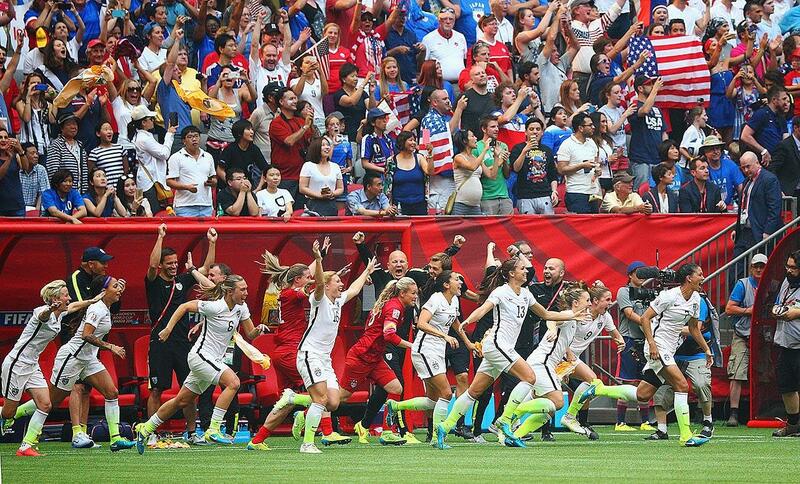 The goal opened the floodgates for a late outburst en route to a 4-0 U.S. victory in front of more than 35,000 fans. Jordan Morris etched his name in U.S.-Mexico lore, as the Stanford University forward scored in his first senior national team start to break a scoreless draw against El Tri at the Alamodome. 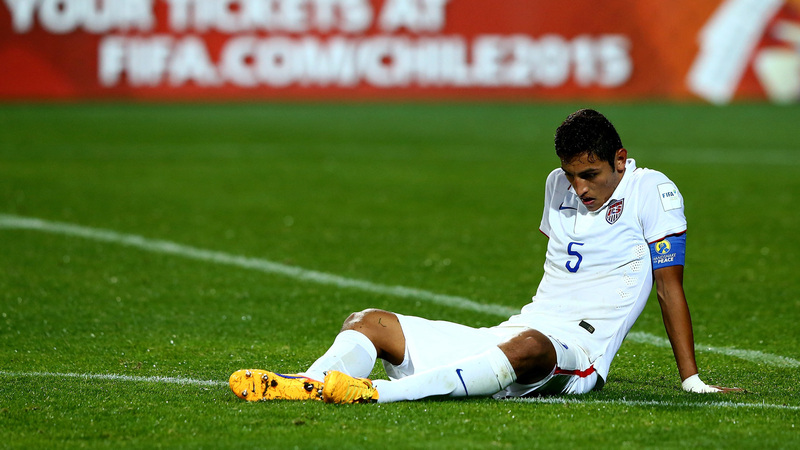 Juan Agudelo collapses to the ground in celebration after his goal at the Alamodome gave the USA a familiar lead over Mexico: Dos-a-Cero. 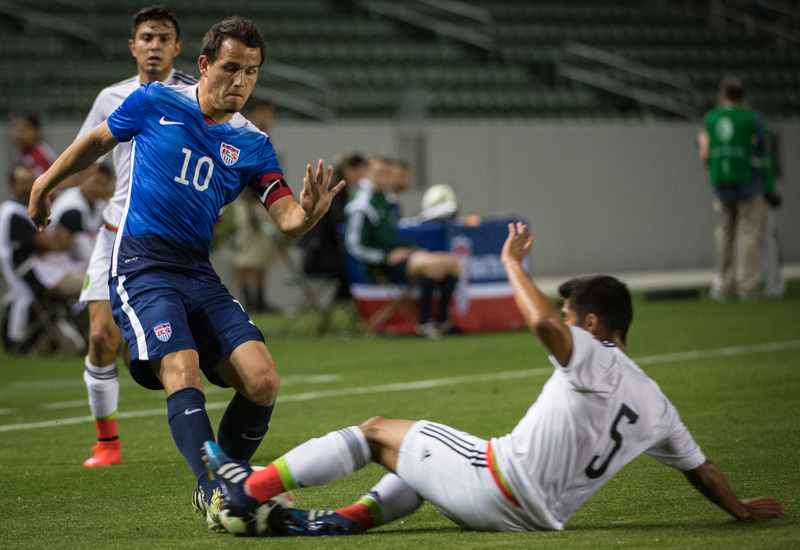 Real Salt Lake's Luis Gil captains the USA to a 3-0 win over Mexico at StubHub Center in Olympic qualifying preparation for both CONCACAF favorites. 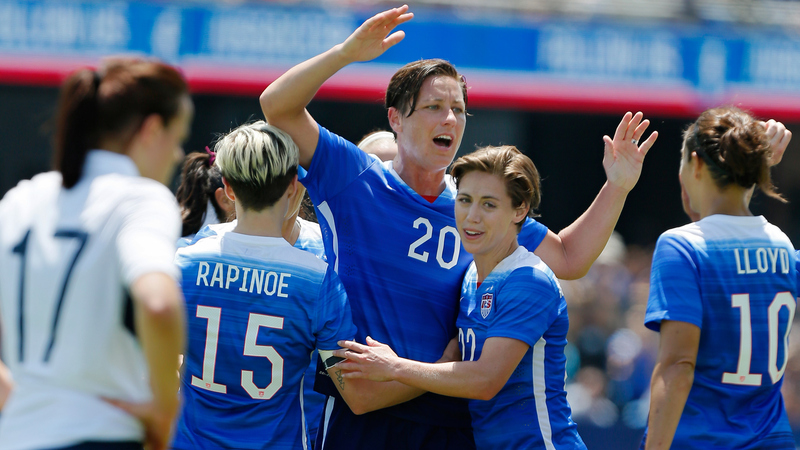 Abby Wambach celebrates one of her two goals vs. Ireland as the USWNT took a 3-0 win on Mother's Day at Avaya Stadium. Sydney Leroux is congratulated by her teammates after one of her two goals in a 5-1 pre-World Cup rout of Mexico at StubHub Center. Maki Tall celebrates his equalizer for the USA as part of a come-from-behind 2-1 win over Myanmar to open the U-20 World Cup group stage in New Zealand. Carli Lloyd gets off a shot through traffic in the USA's final World Cup send-off friendly, a 0-0 draw against South Korea at Red Bull Arena. 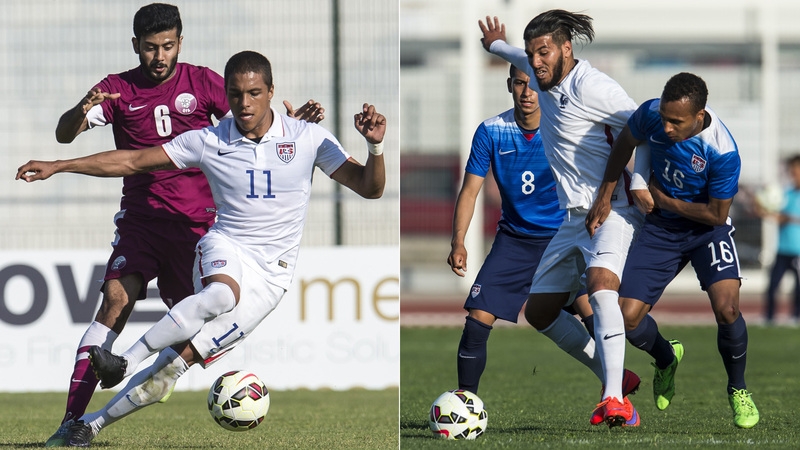 Alonso Hernandez, left, takes on Qatar, while Julian Green, right, vies for the ball against France in the Toulon Tournament as part of Olympic qualifying preparations. 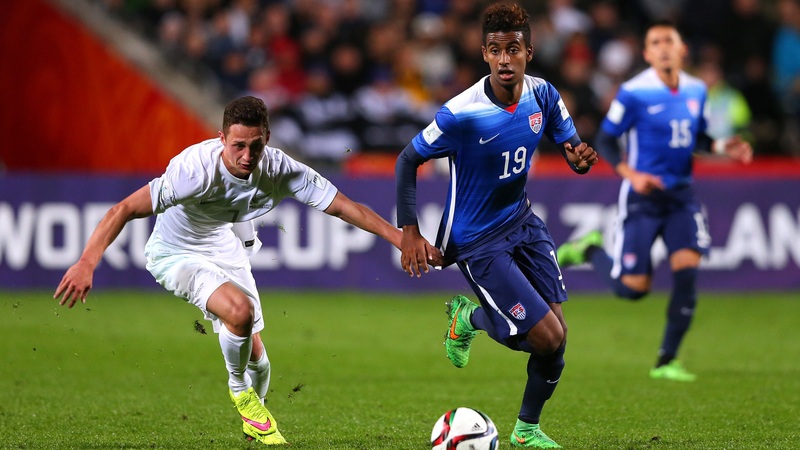 Gedion Zelalem controls the ball against New Zealand in the USA's 4-0 win that cemented a place in the U-20 World Cup knockout stage. From left, Joel Soñora, Gedion Zelalem and Rubio Rubin show frustration during a 3-0 loss to Ukraine that wrapped up group play in the U-20 World Cup. 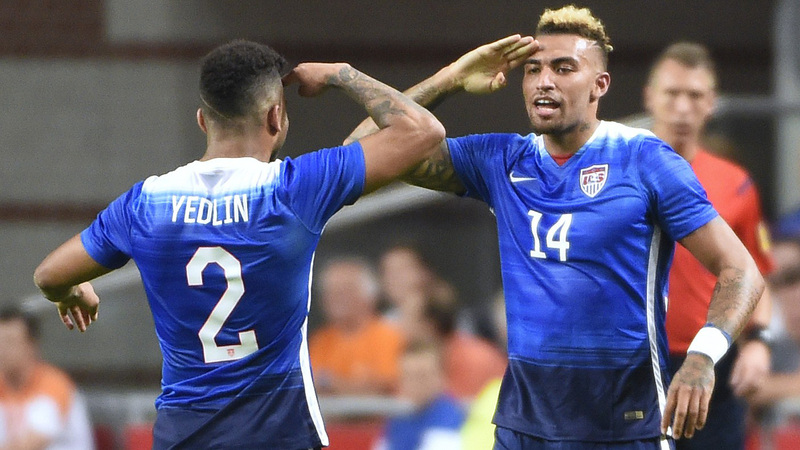 DeAndre Yedlin and Danny Williams salute each other after the latter's goal–his first international strike–brought the U.S. level with the Netherlands at 3-3 in the 89th minute. 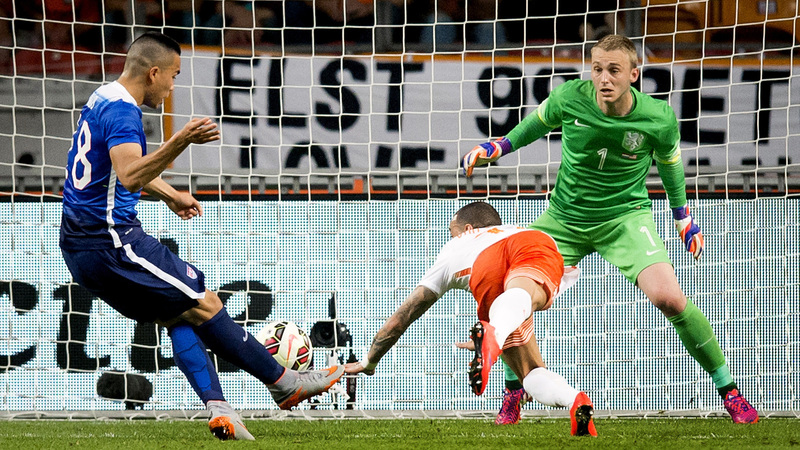 Bobby Wood puts the finishing touch on an epic comeback, with his 90th-minute strike capping a wild 4-3 win for the USA over the Netherlands. 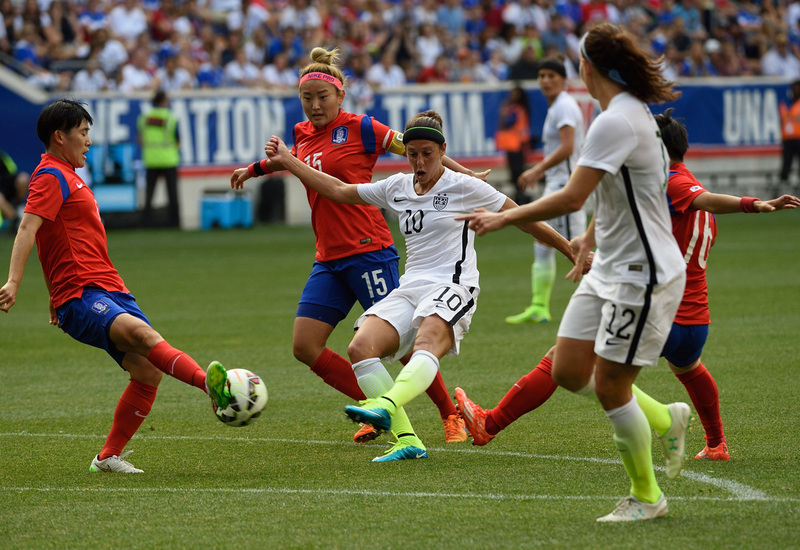 The USA trailed 3-1 in the 71st minute. USA defender Boyd Okwuonu makes a tackle on England's Duncan Watmore in the Toulon Tournament third-place game. 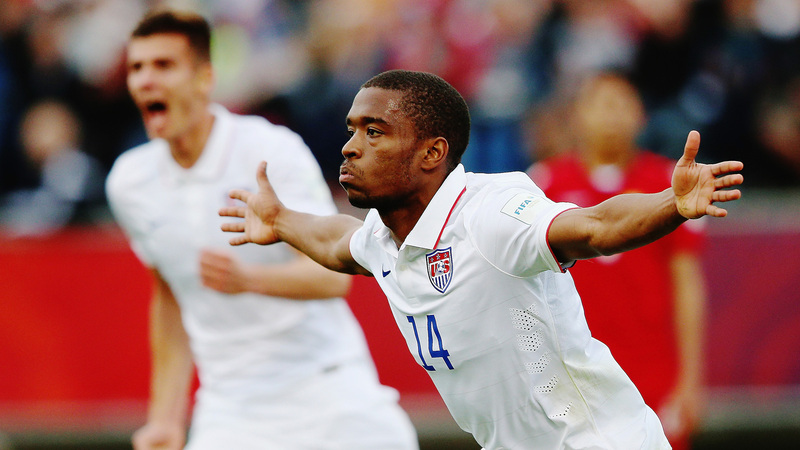 The U.S. U-23s won 2-1, sealing their best finish in the tournament. 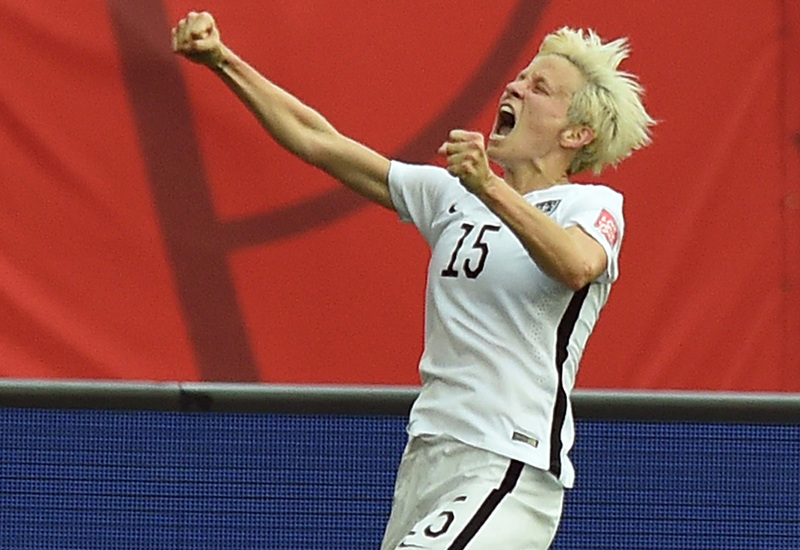 Megan Rapinoe lets out a yell after her second goal, which sealed the USA's 3-1 win over Australia to open Group D play in the Women's World Cup. 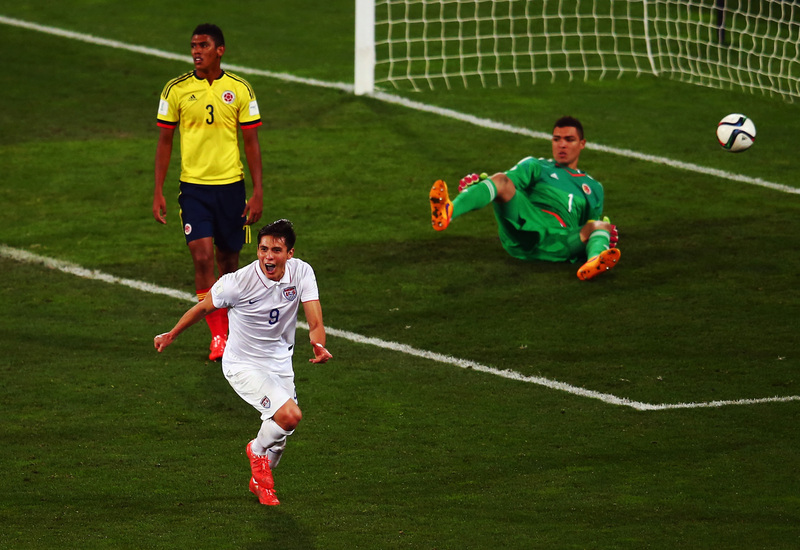 Rubio Rubin celebrates the goal that gives the USA a 1-0 win over Colombia in the FIFA U-20 World Cup round of 16. Zack Steffen's late penalty save preserved the win, as the Americans reached the quarterfinals for the first time since 2007. Michael Bradley was everywhere against World Cup champion Germany, assisting on Mix Diskerud's equalizer and commanding the midfield in a 2-1 win in Cologne. 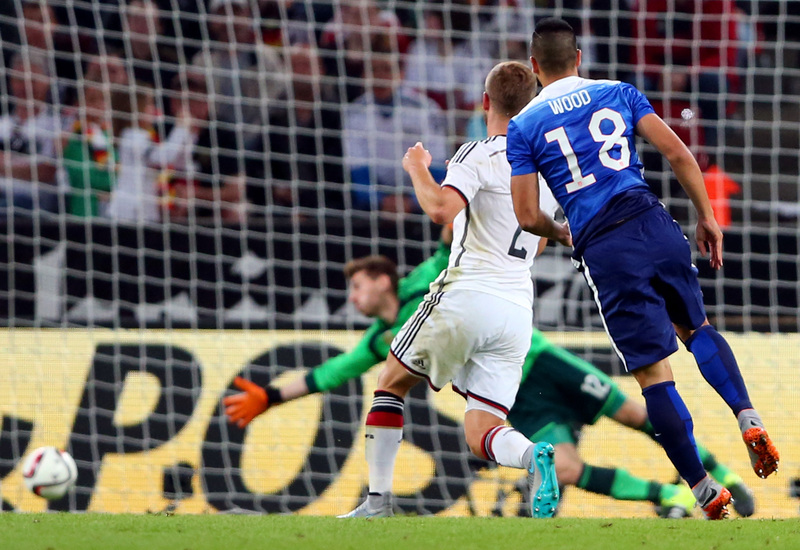 For the second straight game, Bobby Wood came off the bench and scored a stunning winner. He watches his long-range blast beat Ron-Robert Zieler in a 2-1 win over world No. 1 Germany. 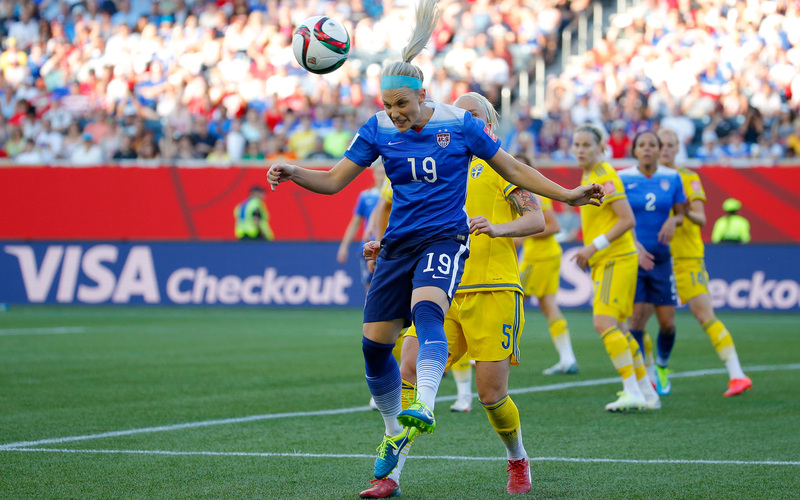 Julie Johnston wins the header in a dominant showing on the U.S. back line, helping the Americans preserve a 0-0 draw against Sweden in the second game of the Women's World Cup group stage. 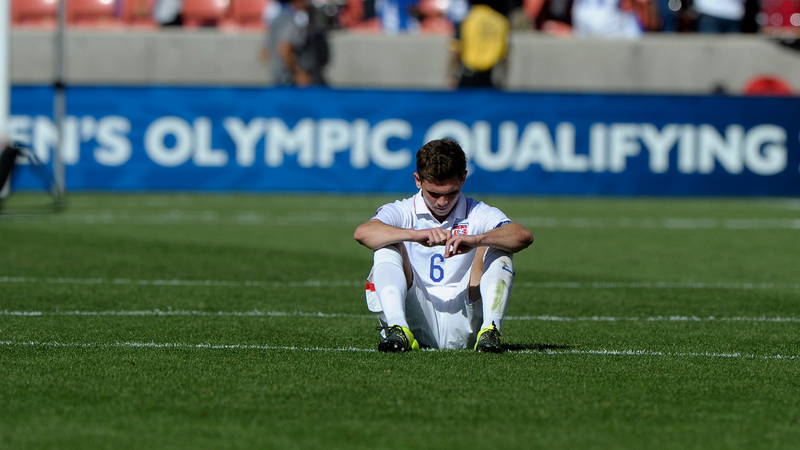 U.S. players' emotions say it all after a gut-wrenching loss to Serbia in penalty kicks at the U-20 World Cup. After a 0-0 draw, the Americans fell 6-5 in PKs, despite Zack Steffen's two saves in sudden death. 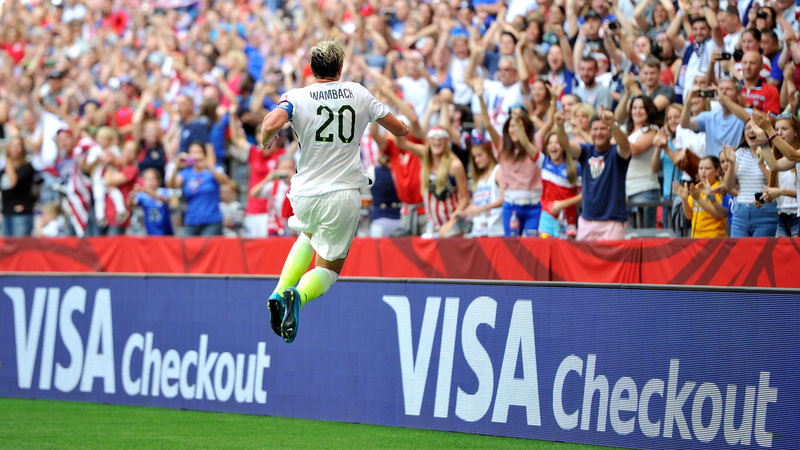 Abby Wambach leaps for joy after scoring in the 45th minute off Megan Rapinoe's corner kick, which delivered a 1-0 win to the USA and first place in Group D of the Women's World Cup. Alex Morgan's goal broke a 0-0 draw, provided relief after Abby Wambach's PK miss and helped the U.S. women to the World Cup quarterfinals after a 2-0 win over Colombia in the round of 16. 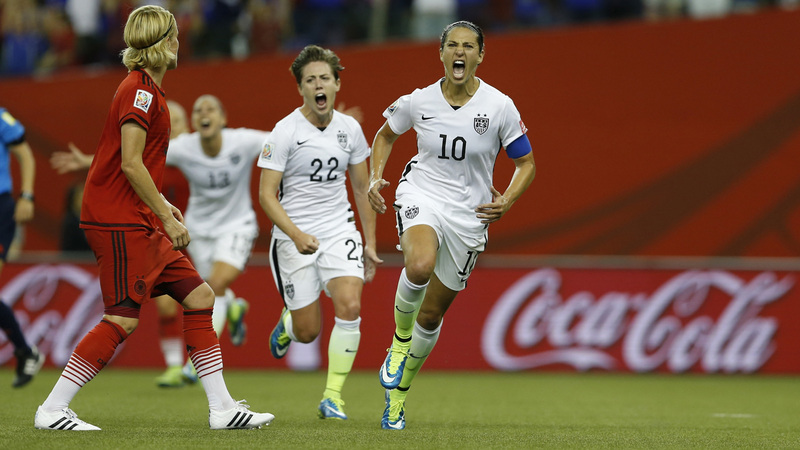 While Carli Lloyd (10) celebrates her goal in the distance, stalwart center backs Julie Johnston and Becky Sauerbrunn rejoice in the goal that put the USA into the semifinals of the Women's World Cup. Carli Lloyd yells in celebration after scoring the penalty that put the USA up over Germany en route to a 2-0 victory in the Women's World Cup semifinals. 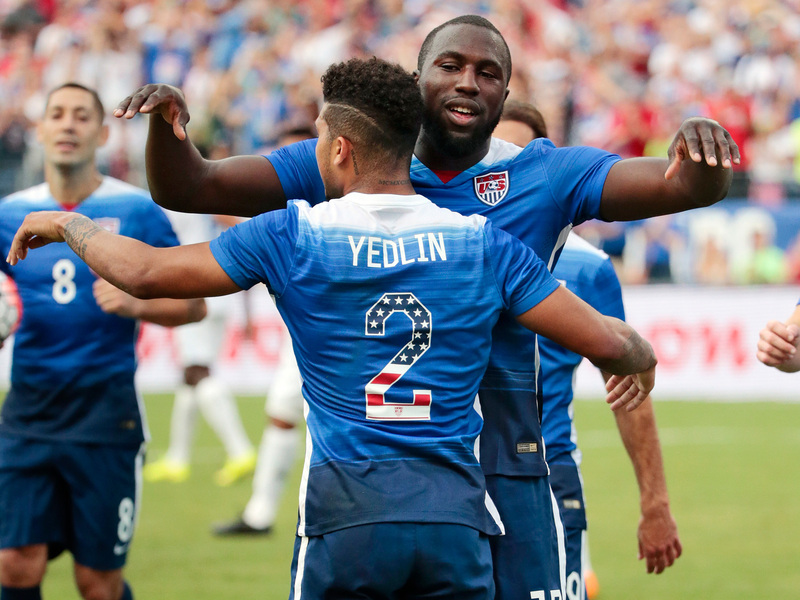 DeAndre Yedlin and Jozy Altidore, wearing special jerseys with stars-and-stripes numbers for July 4, celebrate after a Guatemala own goal gifts the USA a 1-0 lead during a 4-0 win in Nashville, Tennessee, prior to the CONCACAF Gold Cup. Carli Lloyd sets the tone with a third-minute goal in the Women's World Cup final against Japan, the first of her three strikes within 16 minutes that lifted the USA to a 5-2 win and its first title in 16 years. U.S. players rush the field after the final whistle, which sealed their 5-2 triumph over Japan and a record third World Cup title. 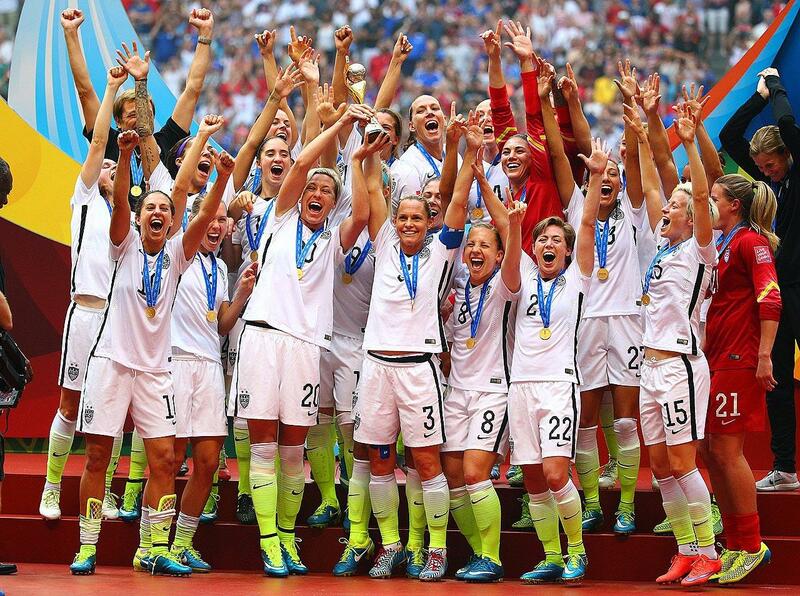 Victorious, the U.S. women's national team raises the World Cup trophy for the third time, but the first in 16 years, after completing a 5-2 win over Japan in the final at Vancouver's BC Place. 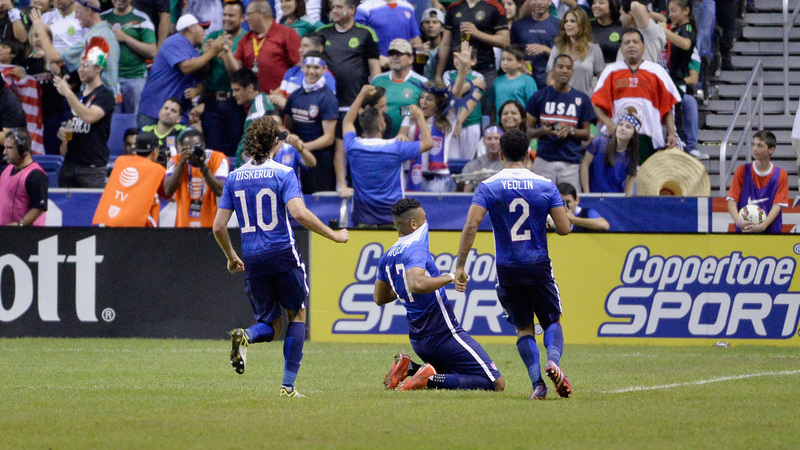 Clint Dempsey leaps in celebration of his second goal in the USA's Gold Cup opener against Honduras. 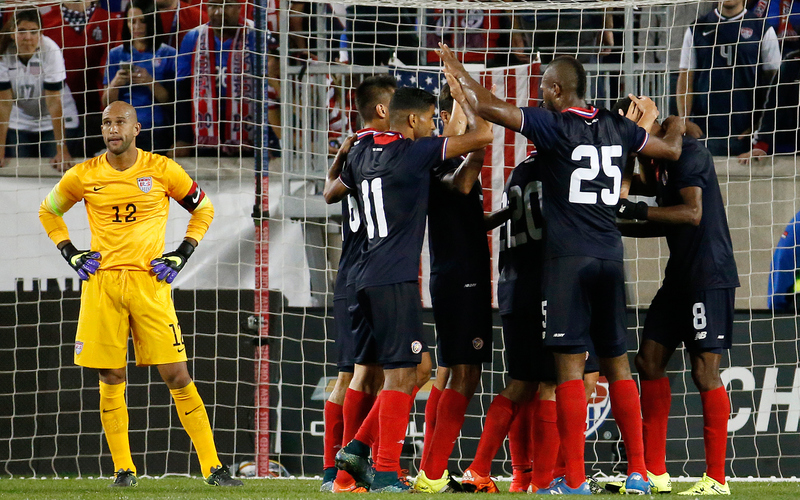 The Americans won 2-1, fending off a late Honduras surge to collect all three points in the start of their title defense. Clint Dempsey (8) is congratulated by his teammates after a 47th-minute goal gave the USA a 1-0 win over Haiti in the Gold Cup. 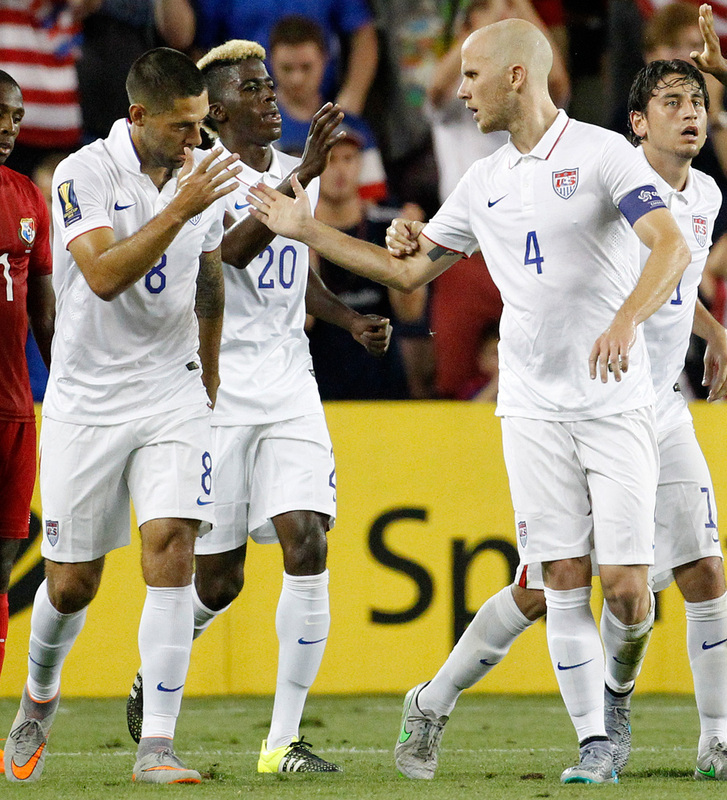 Gyasi Zardes, second from left, came on at halftime and assisted, and the win clinched first place in Group A.
Clint Dempsey, left, and Michael Bradley, right, celebrate after the latter's goal in the USA's 1-1 draw vs. Panama, which wrapped up group play in the CONCACAF Gold Cup. 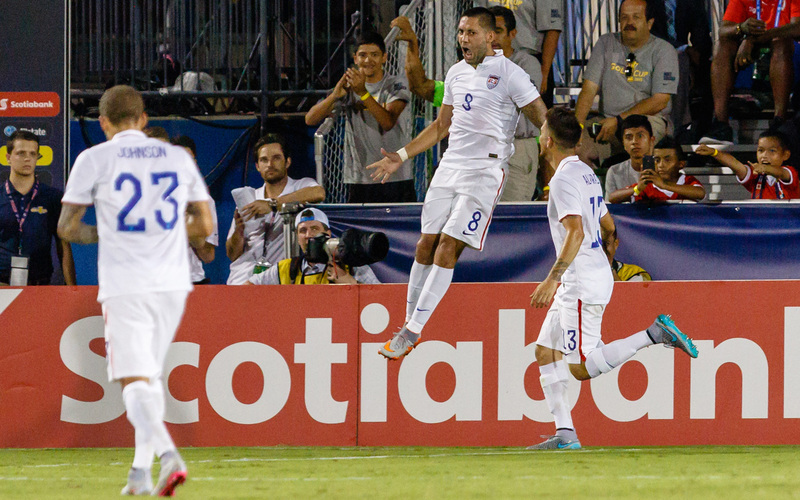 The U.S. men put on a clinic against an overmatched Cuba in the Gold Cup quarterfinals, with Clint Dempsey's hat trick leading the way in a 6-0 rout. 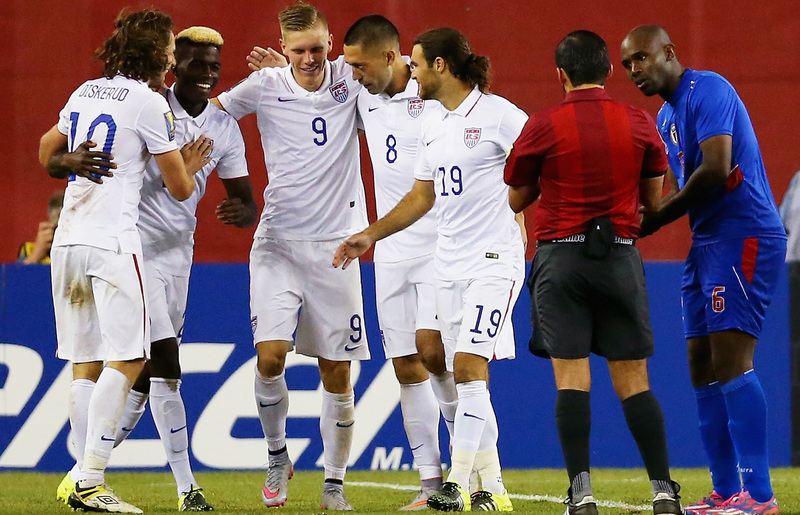 Gyasi Zardes, Aron Johannsson and Omar Gonzalez also scored. 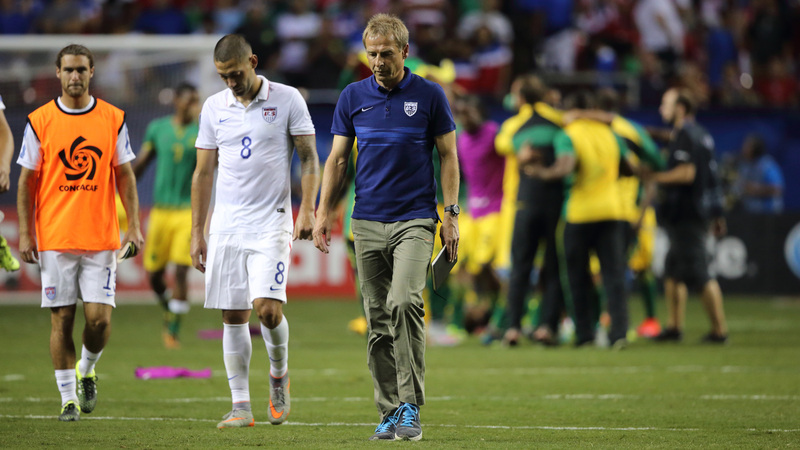 A downtrodden Clint Dempsey and Jurgen Klinsmann walk off the field as Jamaica celebrates a stunning 2-1 win over the USA in the CONCACAF Gold Cup semifinals. 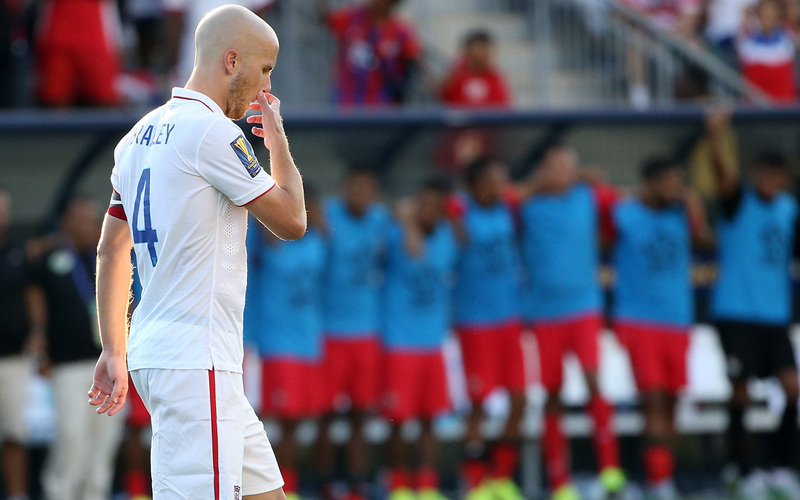 Michael Bradley walks away in dismay after having a penalty saved in a PK shootout in the USA's loss to Panama in the Gold Cup third-place game. 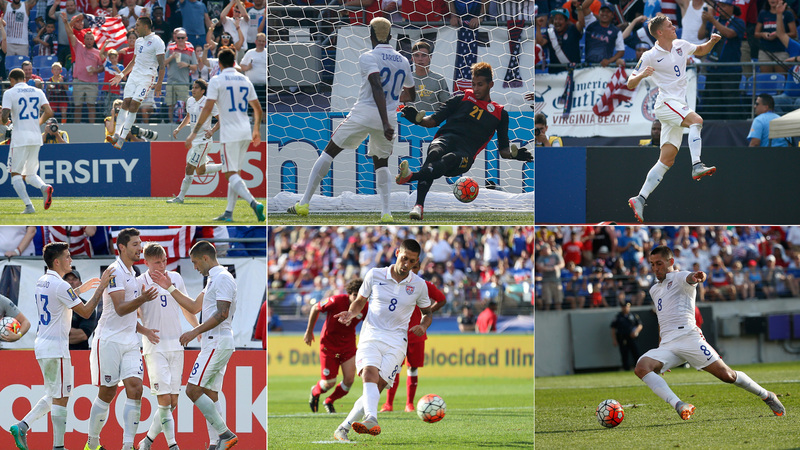 After a 1-1 draw, Panama prevailed 3-2 in PKs, the USA's first shootout in 10 years. 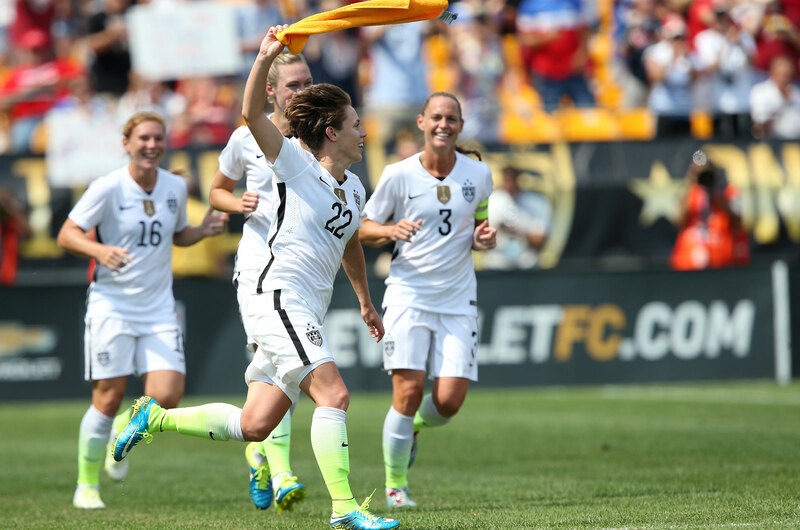 Meghan Klingenberg waves a Terrible Towel in her hometown of Pittsburgh after scoring one of the USA's many goals in an 8-0 rout of Costa Rica in its first game since winning the 2015 Women's World Cup. 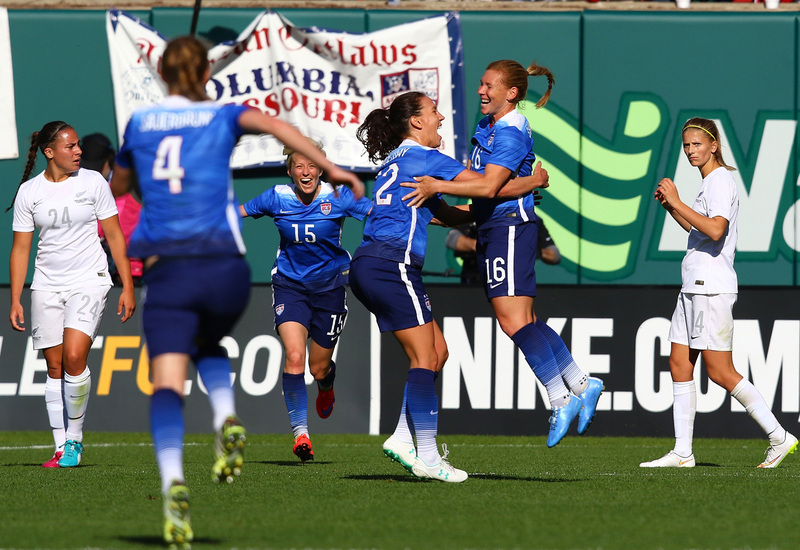 Alex Morgan and Kelley O'Hara celebrate during a second rout of Costa Rica in three days, this one a 7-2 win in Chattanooga, Tennessee. U.S. U-23 goalkeeper Zack Steffen looks on in disappointment as England U-21 forward James Wilson celebrates with Duncan Watmore after scoring the lone goal in a 1-0 friendly win in England. 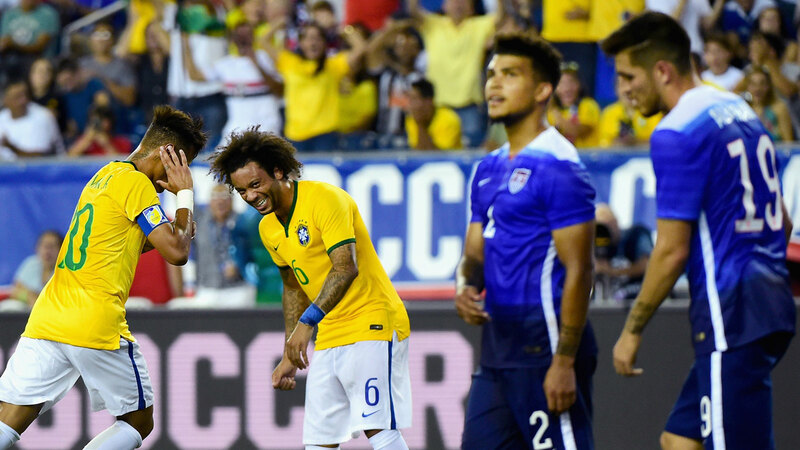 Jozy Altidore, right, is congratulated after one of his two goals that sparked the USA's come-from-behind win over Peru at RFK Stadium in Washington, D.C.
Neymar and Marcelo celebrate while DeAndre Yedlin and Ventura Alvarado look away in disgust during Brazil's 4-1 rout of the USA at Gillette Stadium. Carli Lloyd scored hat tricks in both games and NWSL Golden Boot winner Crystal Dunn scored her first international goals as the USWNT beat Haiti 5-0 and 8-0 in a pair of friendlies in Detroit and Birmingham, Alabama. Haiti replaced on-strike Australia as a last-minute opponent. 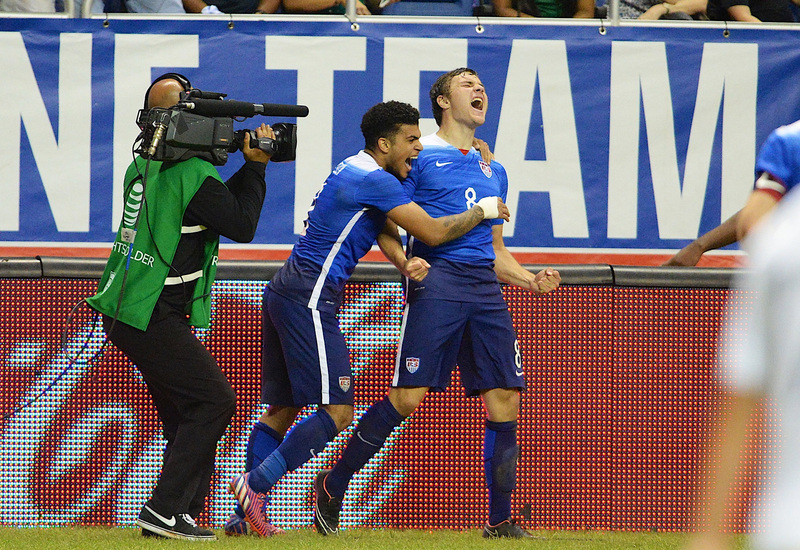 Jerome Kiesewetter, left, and Emerson Hyndman, right, sandwich Jordan Morris after his first-minute goal in the USA's 3-1 win over Canada in their Olympic qualifying opener. 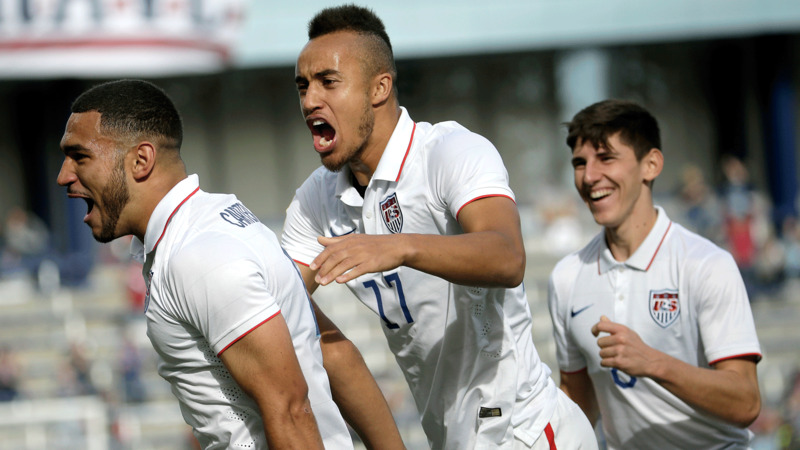 Cameron Carter-Vickers gets congratulated by Jerome Kiesewetter and Emerson Hyndman after opening the scoring in a 6-1 rout of Cuba in their Olympic qualifying match. 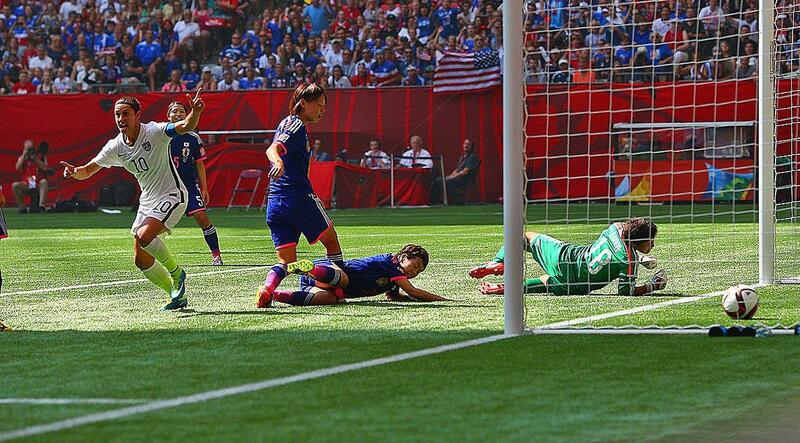 The USA cemented its place in the semifinal round with the win. There was plenty of credit to go around, as the Americans finished off a perfect group run in Olympic qualifying with a 4-0 win over Panama. Jordan Morris and Jerome Kiesewetter came on at halftime and provided the spark needed to seize the three points. 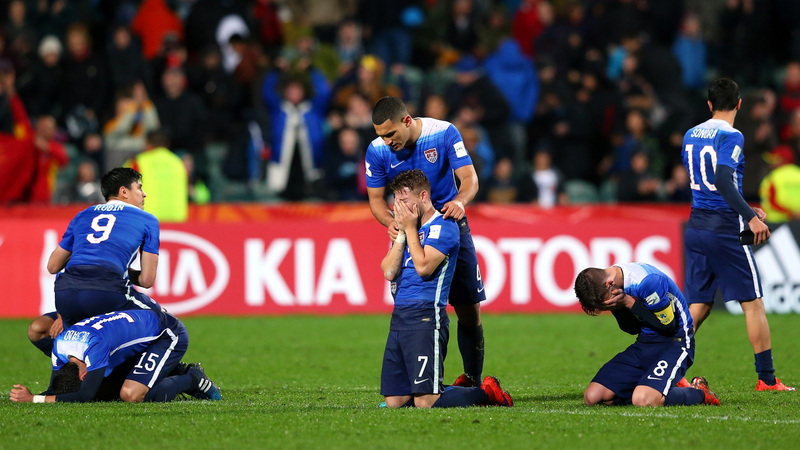 Wil Trapp's reaction says it all, as the USA failed to secure an automatic berth to the 2016 Olympics after falling to Honduras 2-0 in the semifinals of CONCACAF's Olympic qualifying tournament at Real Salt Lake's Rio Tinto Stadium. 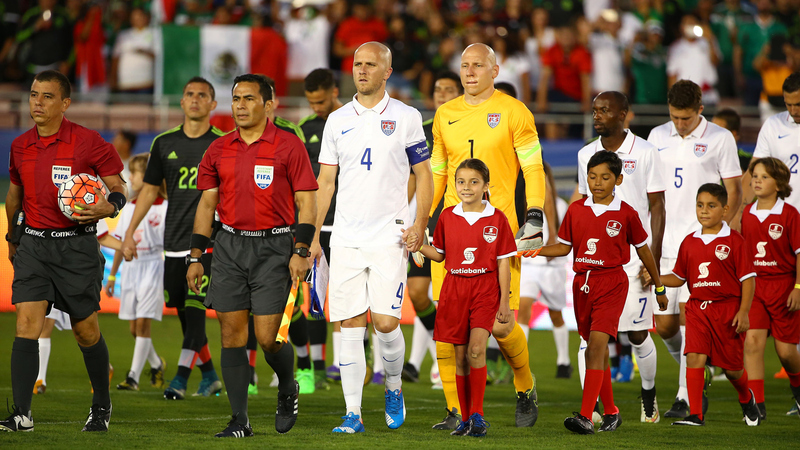 Captain Michael Bradley leads the USA out onto the field ahead of the Americans' CONCACAF Cup playoff vs. Mexico at the Rose Bowl. Geoff Cameron beats Rafa Marquez to the spot and heads home a 15th-minute equalizer off a free kick from Michael Bradley, negating a Chicharito goal five minutes earlier in the CONCACAF Cup playoff between USA and Mexico. 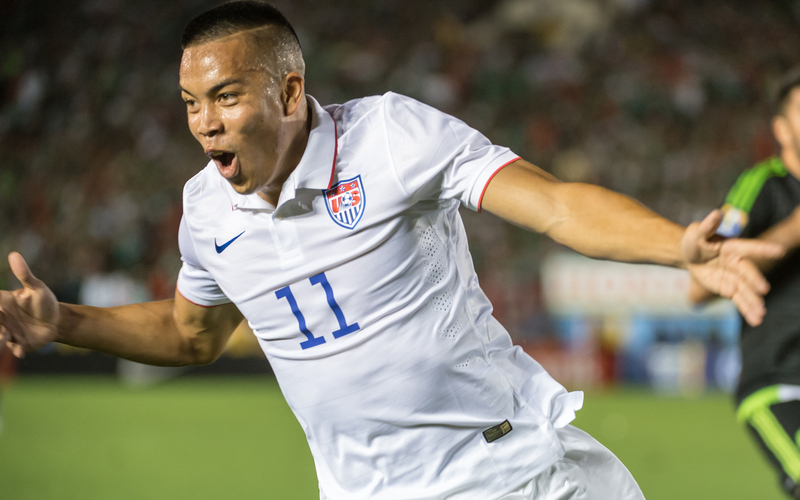 U.S. forward Bobby Wood celebrates his 108th-minute goal vs. Mexico that brought the Americans level at 2-2 after Oribe Peralta had given El Tri the lead in extra time. That reprieve would only last for 10 minutes, though. 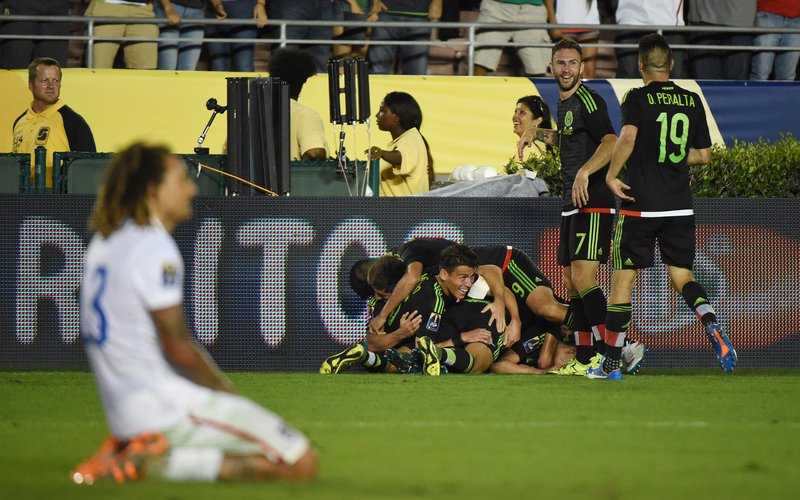 Jermaine Jones falls to his knees in disappointment as Mexico celebrates after Paul Aguilar's sensational volley in extra time captured the CONCACAF Cup for El Tri and sends the U.S. rival to the 2017 FIFA Confederations Cup. Marc Pelosi (15) celebrates after his goal breaks the deadlock and sends the U.S. U-23s on their way to a 2-0 win over Canada in CONCACAF's Olympic qualifying third-place game. 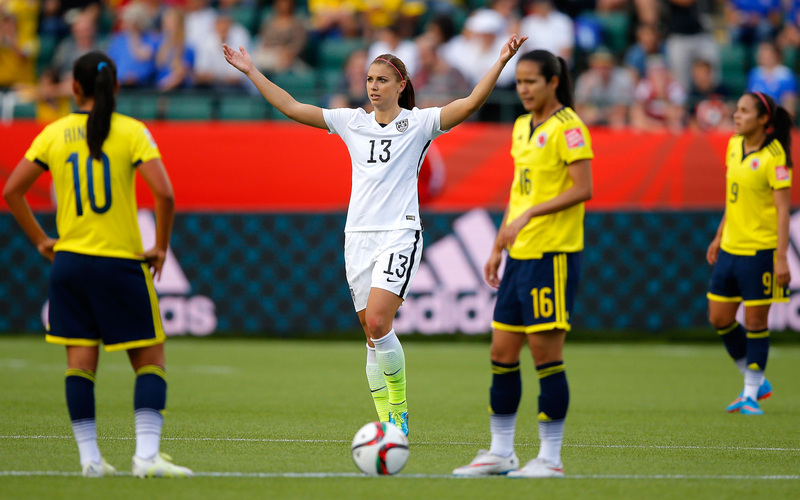 The U.S. still has a chance to reach Rio, but it'll have to go through Colombia in a playoff. Tim Howard can't watch as Costa Rica players celebrate Joel Campbell's goal in a 1-0 friendly win at Red Bull Arena. 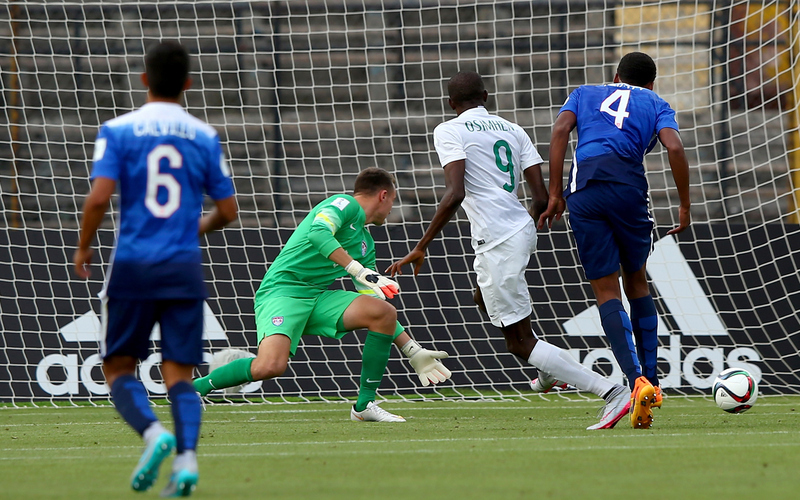 The match marked Howard's return to the U.S. goal for the first time since the 2014 World Cup round of 16. Victor Osimhen scores for Nigeria in a 2-0 win over the USA in the teams' FIFA Under-17 World Cup opener in Chile. USA U-17 midfielder Christian Pulisic watches his opening goal find the back of the net in the Americans' 2-2 draw with Croatia at the World Cup. The U.S. led 2-0 on Pulisic's goal and assist to Brandon Vazquez, but the European side mounted a furious rally to salvage a point. 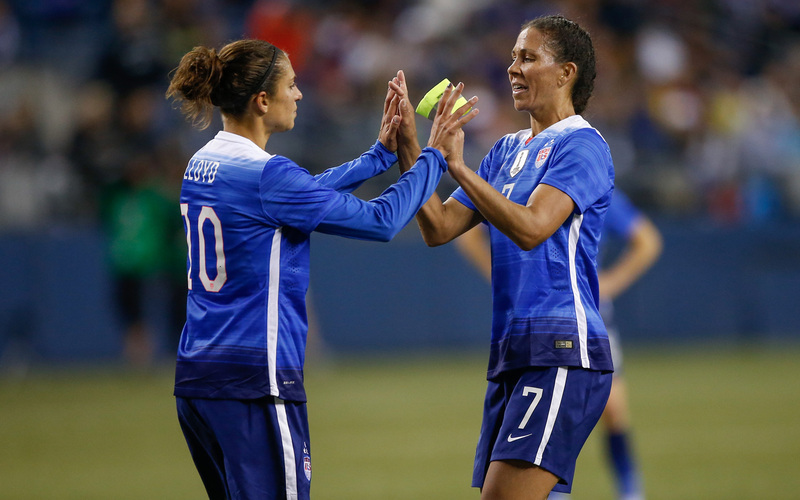 Shannon Boxx, right, passes off the captain's armband to Carli Lloyd in her final act as a player, riding into retirement in the first half of a 1-1 draw against Brazil in Seattle. USA U-17 captain Hugo Arellano sits dejected after a 4-1 loss to host Chile eliminated the Americans from the World Cup in the group stage. 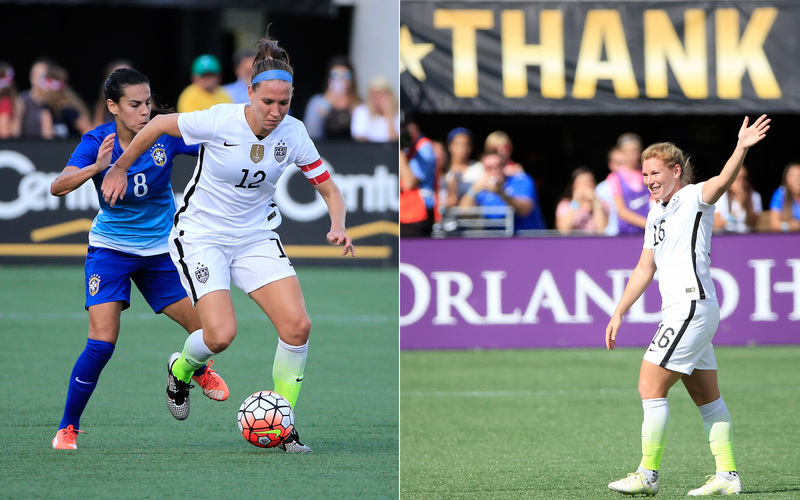 The USA said goodbye to two more veterans, with Lauren Holiday, left, and Lori Chalupny ending their careers during a 2-1 win over Brazil in Orlando. 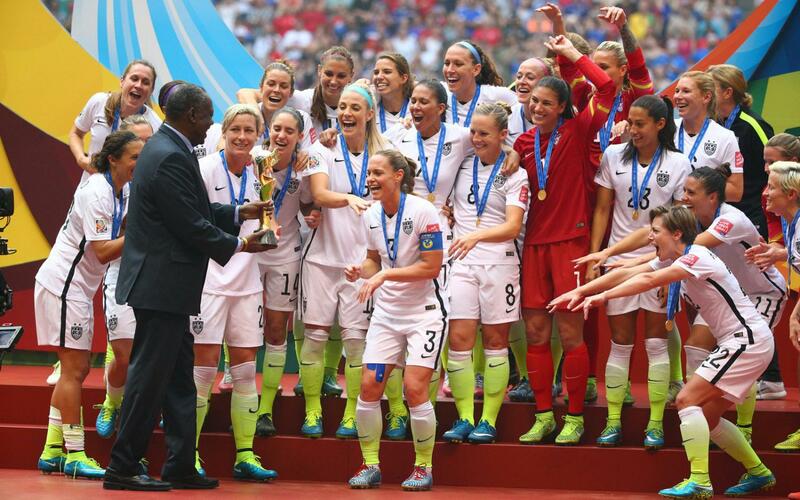 The team improved to 5-0-1 on its World Cup victory tour with the win. 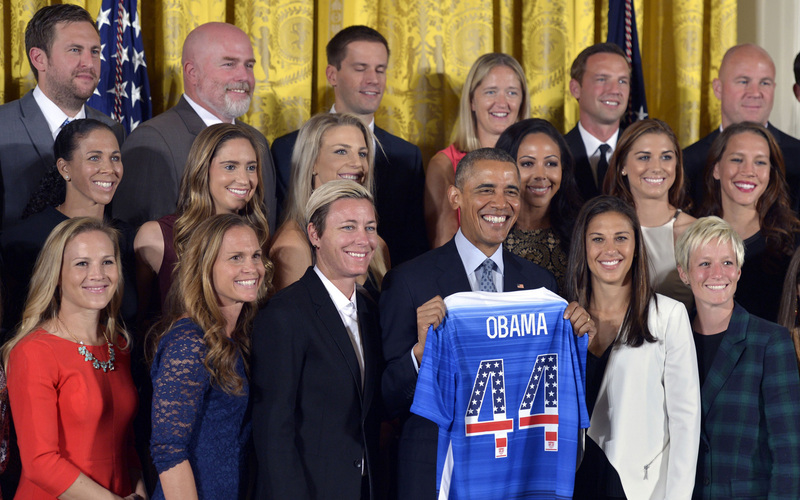 President Barack Obama welcomes the World Cup-champion USWNT to the White House, honoring their triumph in Canada. 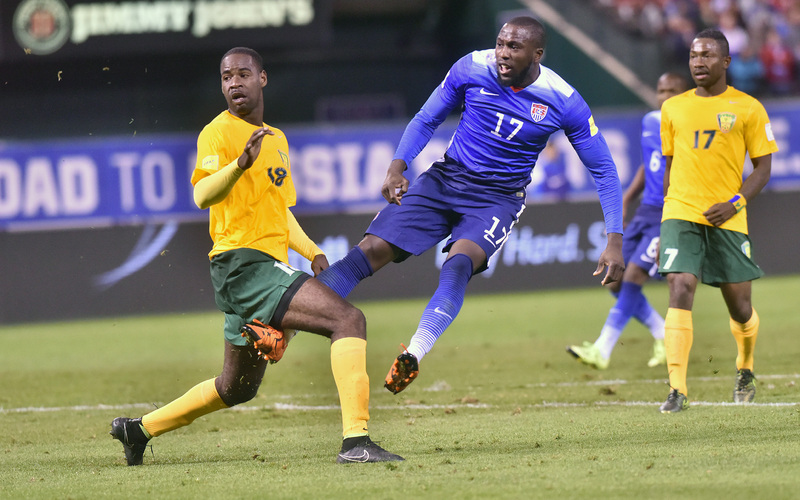 Jozy Altidore watches one of his shots head toward goal in the USA's 6-1 win over St. Vincent and the Grenadines in the opening of 2018 World Cup qualifying. 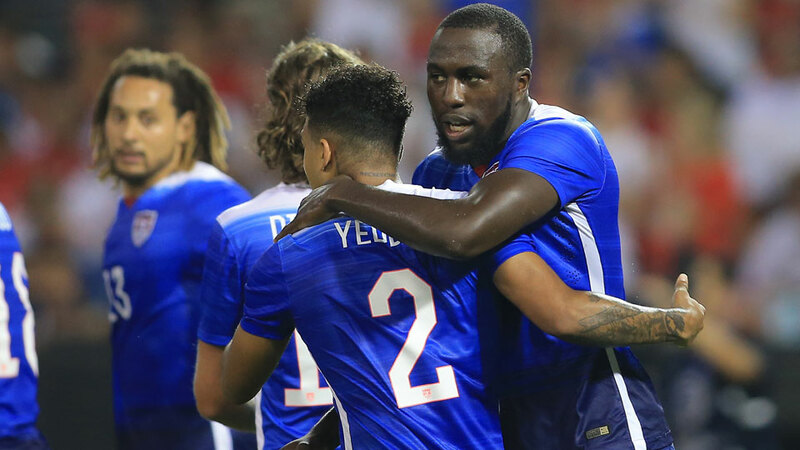 Altidore scored twice, as the USA overcame a shocking early deficit and won at Busch Stadium in St. Louis. 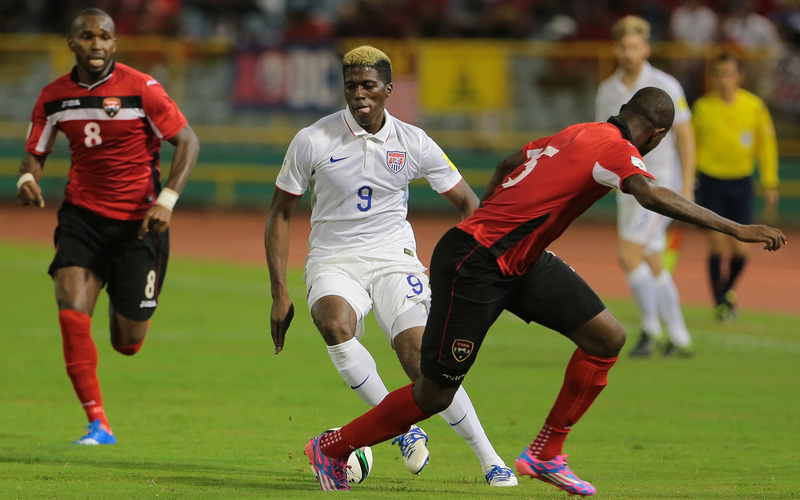 Gyasi Zardes and the U.S. men were held to a 0-0 draw by Trinidad and Tobago in Port of Spain, closing the year with a World Cup qualifying and sitting atop Group C in the semifinal round via goal differential tiebreaker. 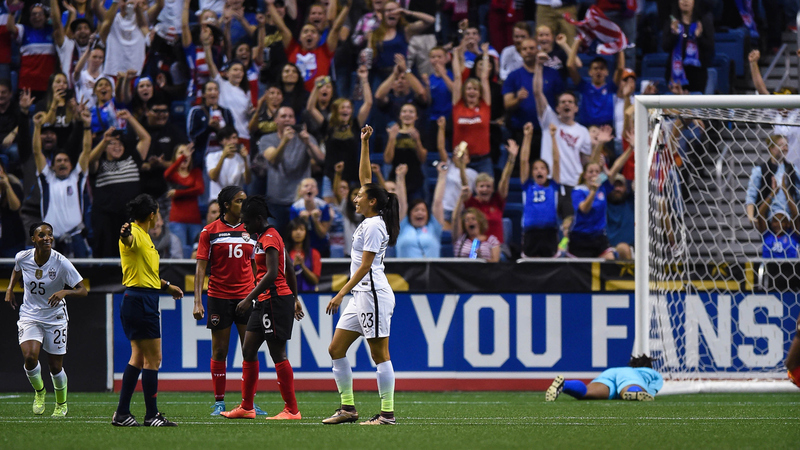 Christen Press triumphantly raises her hand after a goal during her hat trick in a 6-0 rout of Trinidad & Tobago at the Alamodome in San Antonio. 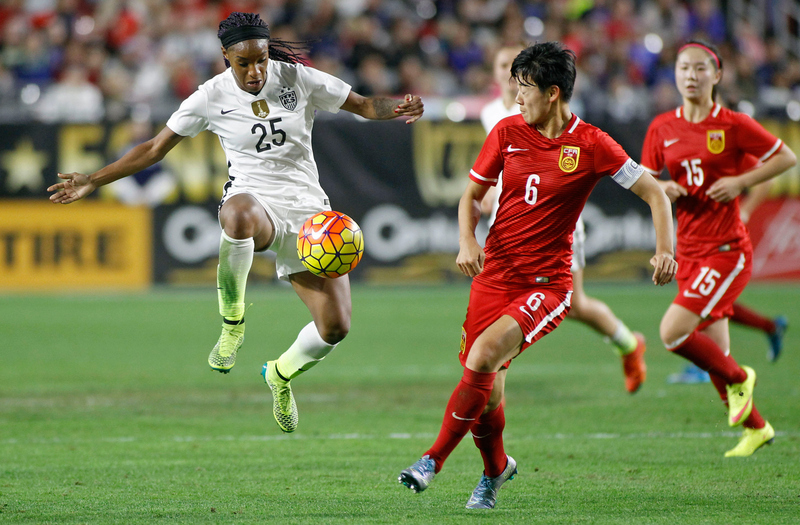 Crystal Dunn leaves her feet to settle a pass in the USA's 2-0 win over China at University of Phoenix Stadium in Glendale, Arizona. Dunn and Christen Press scored the goals. 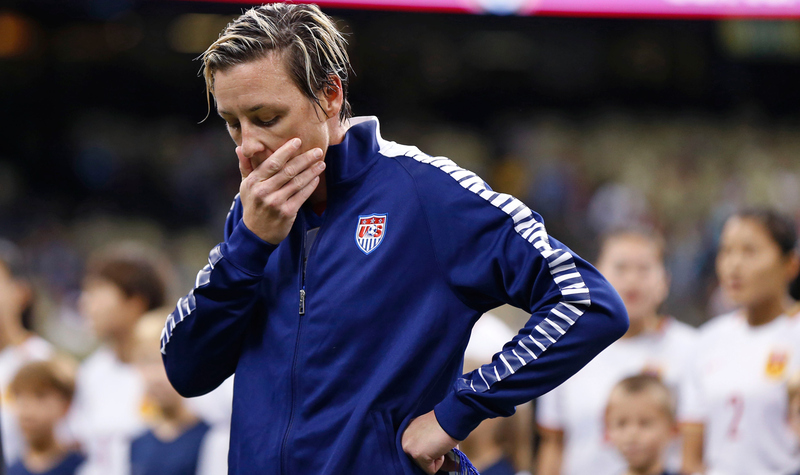 Abby Wambach is introduced in the U.S. lineup for the last time at the Superdome in New Orleans, playing in her final match before retiring. 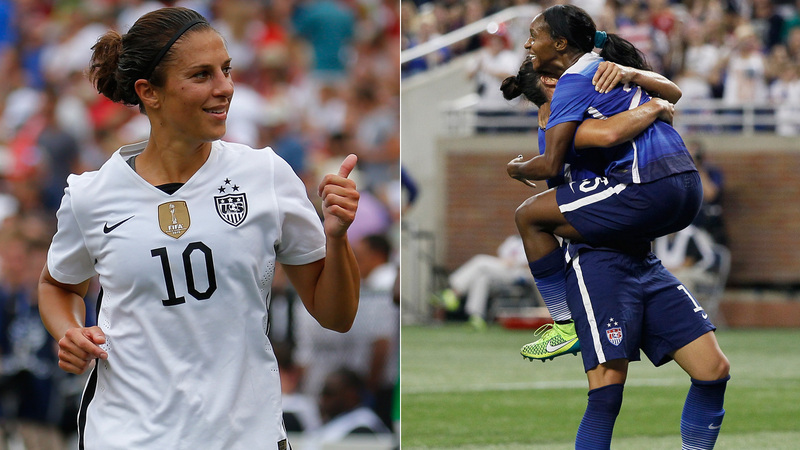 She ends her U.S. career with 255 appearances and an international-record 184 goals.